Our DialzipTM dialup network is compatible with all Mac operatings systems. We will have tutorials for other Mac versions as they become available. You can use this as a baseline to make the connection with your Mac version. To setup your account properly you should be familiar with the dialup protocols of your operating system. Please note that you must have an ISDN modem to connect via ISDN mode and any normal modem will do for 56K or less connections. Although we do not sell modems directly we do recommend several modem vendors who often have specials. Setup takes just a few simple steps. First, click on your Systems Preferences icon, as shown below. Next click on the network icon. Your screen should look something like the above image. The location property should be set to automatic. The Show property should usually be set to internal modem, unless you use something different. 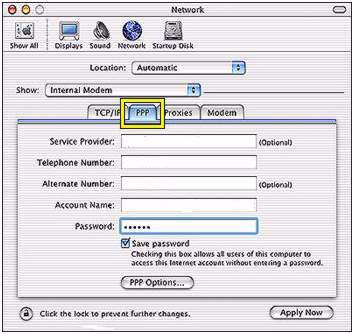 Select the TCP/IP tab as shown. The configure setting should be set to PPP as shown. The IP Address should be set to "provided by your service provider" because it is detected automatically at logon. Under the DNS (domain name servers) section, leave them blank. This should create a dynamic connection (which means the DNS settings are assigned automatically at logon time). Mac's new operating system should have no trouble with such a connection. (Note: if this does not work try to (a) insert all zeros for the DNS entries (0.0.0.0 and 0.0.0.0) or (b) connact us with the dialup number you will be connecting to and we will get the specific DNS entries for you that number to input here. Next, click on the PPP tab. Telephone number: enter the full primary local logon number that you will dial into from our dialup lists. Make sure you take the number from the network number list for which you are subscribed. Alternate: If there is a second local number on our lists feel free to enter it. Enter the logon username and password we provided exactly and fully into the appropriate boxes (most Mac versions require all lower case). Check the Save password box. Click apply now and then exit this window entirely. Your dialer has now been automatically configured to use your account with us. To dial in, simply use the Finder icon in your dock and then click on the Applications icon. Once in the applications folder look for the Internet Connect icon. Click on it to get online. You should drag this icon into your dock so you no longer have to go through the applications screen to find it.